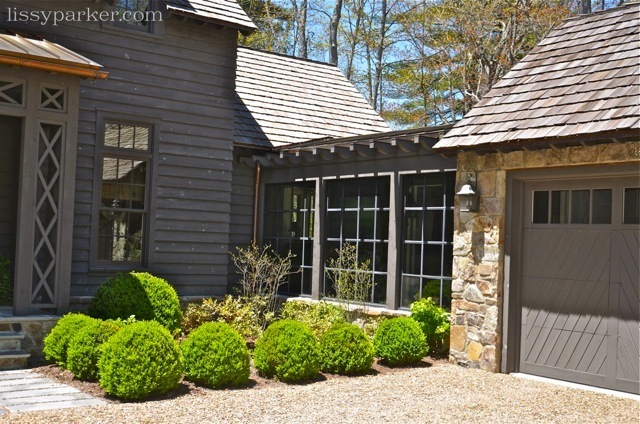 The charming combination of a gravel drive, cedar shakes on the roof and stone walls lured my car right off of the road and down this home’s drive. 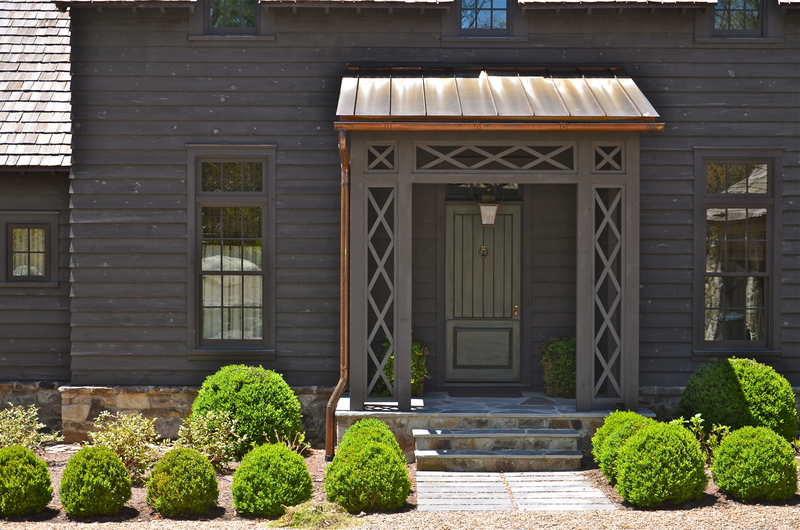 This charcoal-colored charmer just oozes curb appeal. 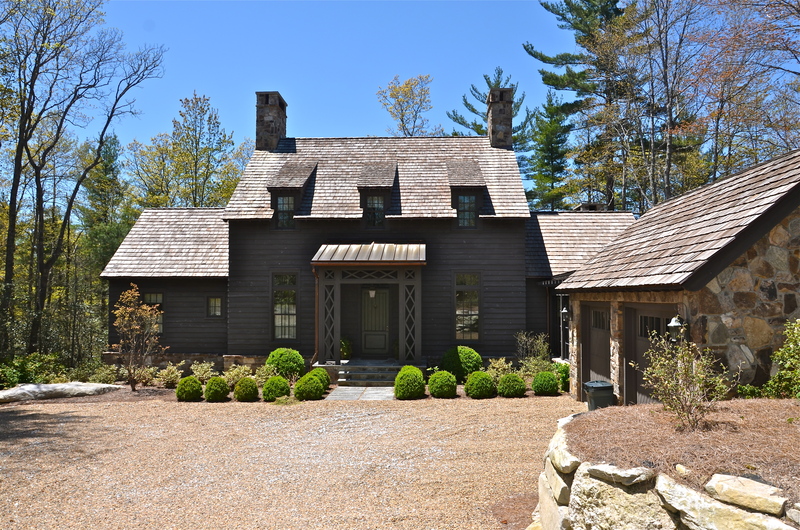 The entry porch has a large open ‘X’ design and is covered by a standing seamed copper roof. 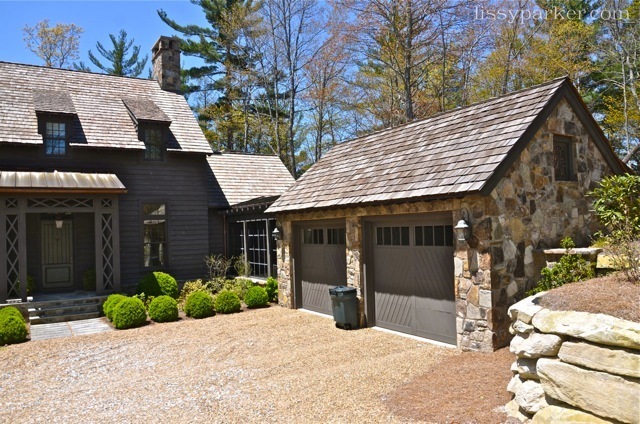 The stone covered garage is connected to the house by a glass enclosed walkway. I would love this little greenhouse for fruit trees in the Winter—Myers lemons and limes sound wonderful. Boxwood, boxwood and more boxwood surround the Entry garden and parking area—you can never have too many boxwood! I might just have to add a ‘Greenhouse’ breezeway to my new garage addition—I’m enclosing my garage and adding a ‘ladies lounge’ to the mountain house. A’ ladies lounge’ consists of a pantry, laundry room and an office/flower room— phase two has already started in my mind. 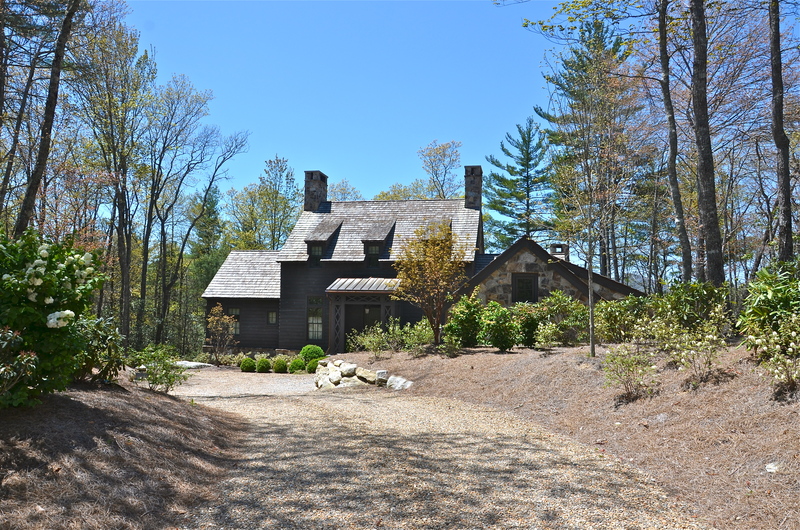 Enjoy the little tour of this latest house crush and let me know what you think. Lissy you are the best house sleuth!! This is one of my favs…but could you get an invite to see the interiors please!! The inside is very warm and welcoming—no one was home that day. I do like the entry, but can’t help but feel that it’s very dark inside. I vote for replacing the solid door with a … Surprise … Dutch door, painted barn red. The inside is painted a very creamy white. Check out my Pinterest board ‘Entries.’ The one with turtle shell on the wall is this house. Also, the stone floored passage way is on that same board.